We’re covering this exciting Rugby Union event in our Ma Nolan’s venues. 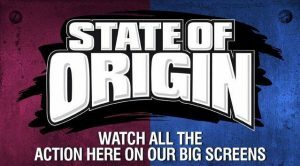 Referred to as Australian sport’s greatest rivalry, the State of Origin series is one of Australia’s premier sporting events, attracting huge television audiences and usually selling out the stadiums in which the games are played. It is regularly described as being the pinnacle of rugby league, even in comparison with international competitions.